I’ve been especially quiet on social media and on my blog for the past 2 months, but I’m excited to officially share that Jun and I bought a home! 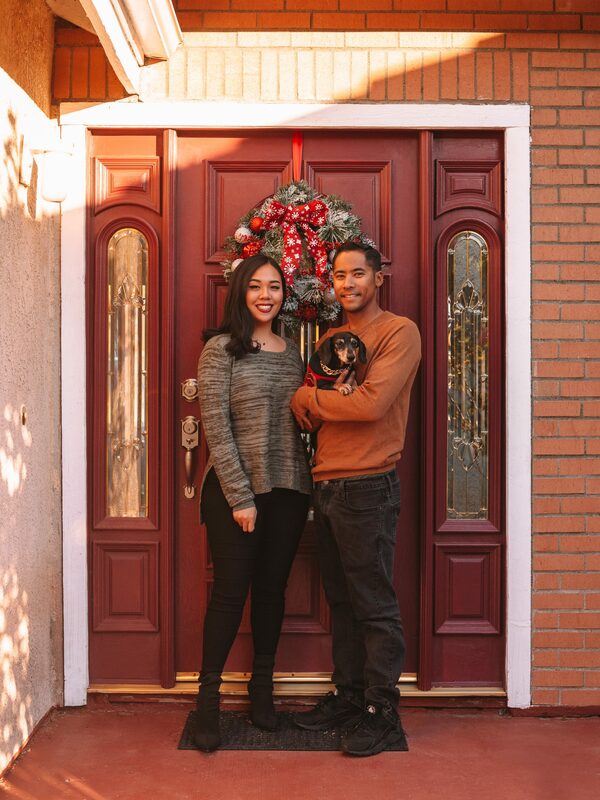 We’ve been looking for homes since February and finally closed escrow in early November. It’s been a wild ride since we’ve moved in due to unpacking, getting furniture and appliances, renovations, maintenance work and changing out tons of fixtures, but we’re making great progress in getting our home the way we want it! Now, I know I’m going to be asked this question: how old are we, and how were we able to get a house so young? Jun is 30 and I am 26. I know, we’re pretty young to be homeowners! I feel like our millennial generation struggles with saving up to buy a home because of things like student loans and debt, so the more popular housing option is usually renting. Many young adults also enjoy traveling, hate staying in one place, and love to live in big cities, so a hip apartment in a trendy area is usually the way to go. However, Jun and I were planning ahead for our future and decided it was best for us to purchase a home straight from moving out of our parents’ homes. It made more sense to save up while our living expenses were minimal instead of paying to rent a place and save up for a down payment at the same time. Our home buying journey was by no means an easy one, but we finally got to the end of the road and are now proud homeowners! Even as a former Realtor, I wasn’t expecting as much stress, headaches, and heartbreak as we experienced. 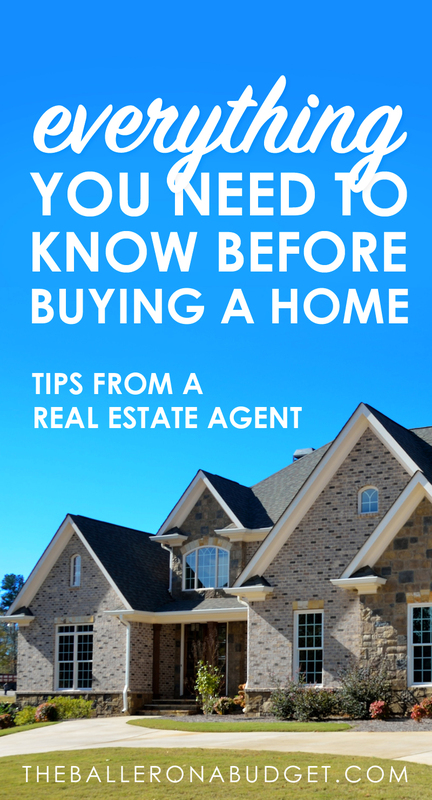 Purchasing a home definitely involves a lot of planning, patience, trust and saving, so here are some of my best tips from my experience as both a new homeowner and a former real estate agent. Why Is It Better to Buy vs. Renting? Tax benefits. The interest and property taxes of your mortgage loan counts as a tax deduction, so you may wind up paying less during tax season. And if you ever receive a wage increase that forces you into a higher tax bracket, you’ll be required to pay more in taxes. However, the tax credit you receive as a first-time homeowner can save you hundreds to even thousands of dollars in taxes. Also, if you work from home, a percentage of your home expenses (mortgage, utilities, etc.) can be deducted as a business expense. Equity. Sure, monthly rent may be cheaper than a monthly mortgage payment, but your rent doesn’t provide any long-term benefits. When you rent, your monthly payment actually goes towards paying off the mortgage of whomever actually owns the property. So your landlord is charging you to live in their dwelling while you pay off their mortgage! Knowing this, it makes more sense to buy your own place and have your monthly payments go towards paying down the balance of your own mortgage – not someone else’s. Appreciation. Much like buying a car, owning a home means that you own property that has value. But unlike a car, as time passes, the value of a home doesn’t decrease the way a car does – it actually increases. There are a variety of factors that affect this such as area gentrification, population increase, or location desirability, but over time, homes will always appreciate. So if a few years down the line you think it’s time for a new home, it’ll be likely worth more than what you originally bought it for. More control of repairs. Most people would never consider it a blessing to be responsible for their own repairs. But if your landlord is lazy or simply unwilling to address much-needed repairs like leaky pipes or broken air conditioning/heating, you will be at the mercy of their decisions. If your landlord allows you to conduct major repairs, expect to pay for them out-of-pocket, which just means that you’re investing more money towards a property that isn’t yours. Freedom to renovate. Many landlords and apartment complexes do not permit any major renovations to be done at the discretion of renters. This means that you can’t paint your rooms the color you want, nor can you change the countertops or do any other upgrades. You’re restricted to the aesthetic choices of your landlord’s, so if you don’t like the laminate countertops or broken tiles, you’ll have to deal with it unless they tell you otherwise. While most people believe that buying a home is a costly process, it doesn’t necessarily have to be. As long as you plan ahead of time, do your research and are financially responsible, anybody can own property. You’ll need a down payment. Unless you intend on paying for a property in all-cash, you’ll have to get a home loan. And more often than not, you’ll need to pay a percentage of the purchase price upfront before moving in. The most common home loans are FHA, conventional, and VA loans. FHA requires 3.5% down, conventional loans require 20% down, and VA loans don’t require a down payment, but are exclusive to veterans and active military personnel. Of course, all loan programs have varying terms, so be sure to consult with your chosen mortgage lender to see what options are available to you. Be aware that some banks may offer flat-fee down payments that are oftentimes too good to be true, such as $0 down, $500 down, or $2,000 down, but be sure to read the fine print. Most programs like these usually carry a much higher interest rate or other terms that may hurt you in the long run. Don’t forget your closing costs. On top of your down payment you will also need to have enough funds for your closing costs, which are between 2 – 5% of the purchase price. Closing costs are the fees required by the escrow company and mortgage company, and both the buyer and seller are required to pay their own. You can ask your Realtor to request the seller to pay for your closing costs (just like you can negotiate for repairs and other things), and depending on the situation, they may say yes. However, you should always prepare to have extra funds available to pay for your closing costs – if you don’t have them, you won’t be able to close escrow and obtain the house. Be aware of extra expenses. During escrow, you may have to pay for things like your earnest money deposit (which goes towards your down payment), a home warranty, inspections, repairs and more. No two houses are alike in terms of additional expenses, so take advantage of the inspection report findings during escrow and decide if the house you chose is worth committing to. Watch your debt. When a lender pre-qualifies you for a loan, they will look for 3 main things: your gross income, your credit score, and your consumer debt. If your monthly consumer debt (minimum monthly payments, not your outstanding balances) exceeds roughly 30% of your monthly income, you may not qualify for a loan. You can calculate your DTI (debt-to-income) ratio using this DTI calculator. Avoid unnecessary spending when you begin looking for a home. This means no new cars, no new furniture or any other expensive purchases. When you qualify for a mortgage loan, the lender will be taking a close look at your bank statements to review your spending habits. So if they see that you’re spending a few thousand dollars here and there, they might consider you a high-risk investment and won’t want to offer you a loan. Don’t apply for a new credit card or loan. When you’re getting qualified for a mortgage loan, the lender will also take a look at your credit score, which means that any inquiries on your credit can alter your score. In order to qualify for certain loan programs your credit score needs to meet a minimum requirement, so it’s crucial not to make any moves that could impact your score negatively. If you’re receiving financial help, leave a paper trail. It’s common for many people to receive monetary “gifts” from parents or relatives to help buy their home, but the mortgage lender will need to verify where the funds are coming from. So if Mom and Dad are helping, make sure the route that the money goes through doesn’t raise any questions (moving money across multiple bank accounts triggers red flags). It also helps to inform your lender – more than likely your lender will require your parents to provide a gift letter that contains their written consent. Don’t get a new job. Even if your current job is awful, try to stick it out until after you close escrow and move into your new home. Lenders prefer giving loans to people who have a committed and long-term job history since a person moving from job to job every few years can pose as a high-risk investment. They want to see that you’re able to make your monthly mortgage payments, so keep your job history looking pristine. Your mortgage lender will review your finances again right before closing escrow. Just because you’ve been prequalified for a loan doesn’t mean you’re in the clear! They will take one more look at your bank accounts and see that you still look financially healthy prior to closing. Remember, don’t make any big purchases or huge financial decisions until after you close. Have at least 2 month’s worth of mortgage payments before moving in. After you pay your down payment and closing costs, you don’t want to have $0 in your bank account. In fact, some lenders will actually require you to have a certain amount of money left in the bank before funding the loan, so continue saving diligently even after you’ve been qualified. I recommend having at least 2 month’s worth of mortgage payments before moving in so that you have some financial cushion in case you incur any incidental expenses (surprise repairs and emergency furnishings are no fun, trust me). Now to the fun part: finding your perfect home! It’s easy to get carried away when looking at beautiful homes, but before you get your head in the clouds, there are a few things you must know. Look at homes after you’ve received your pre-qualification letter or DU underwriting. Even if you’re working with a real estate agent, I suggest holding off on looking at homes until your mortgage lender gives you a pre-qualification letter, or better yet, DU underwriting. Both items show proof that you have been verified by the lender and state that you can buy up to x amount in a home, which should give you an idea of what your budget looks like. There’s no worse feeling than looking at homes you can’t afford, so save yourself the heartbreak and avoid house hunting until the lender has given you the green light. Watch out for HOA fees and property tax assessments. Newer homes tend to have pricey (and non-negotiable) homeowner association fees that can go up to a few hundred dollars every month, and they aren’t included in your mortgage payment. And newer homes also mean that your annual property taxes might be much higher than homes in already-established areas. If you’re working with a Realtor, make sure your agent informs you of any possible fees associated with homes you look at so that you’re aware. Don’t get distracted by upgrades. Marble countertops, new Berber carpet, fresh Benjamin Moore paint: although it’s pleasing to the eyes, remember that these kinds of upgrades can be done to any home after you’ve purchased it, and it may even be cheaper to do it this way instead of buying a completely rehabbed home upfront. It might be convenient, but fancy upgrades may raise the price of the home exponentially, so try not to get swayed and focus on more important things like the floorplan, location, and your housing needs. Always consider your safety. Do your research on the location of the home and its surroundings: does the area have a high crime rate? Do you feel safe sleeping alone at night? Do the neighbors often get their packages stolen? These are very important factors to consider, especially if you’re a young female or spend a lot of time at home. Remember that you aren’t the only buyer on the market. If you’ve found a home that you really like, be aware that another buyer may be interested in it too. Placing an offer as soon as you can and making a reasonable offer will help increase the chances of being chosen by the seller. Conversely, making unreasonable demands, being noncompliant or unresponsive are behaviors that sellers don’t like, so avoid doing such things if you want your offer to be accepted. If you’ve been thinking about buying a home, you should consider working with a real estate agent to represent you and help you in the process. There are many legalities when it comes to home buying, so just like seeking out an attorney for legal help, I highly recommend that you consult with a trusted real estate agent to help you get into a home. Just like with doctors, Realtors have all passed the board exams, but not all of them will fit your needs. I always recommend finding a Realtor that’s been referred by someone you know, as their experiences speak volumes about the quality of their work and professionalism. Although they’re free, I don’t recommend finding properties on Zillow, Trulia or any other third-party real estate websites since they aggregate listings from the MLS (Multiple Listing Service), the official website that Realtors publish their listings to. The MLS is accessible only by licensed Realtors, which means that working with a Realtor is your best bet to find updated property listings. The public listings on websites like Zillow and Trulia are pulled from the MLS, but most often they either aren’t up-to-date or important information is omitted from the listing. Once, my friend found a few homes on Trulia around $350,000 and when she gave the listings to her Realtor to look into, her Realtor discovered that those listings were auctions whose starting bid was at $350,000 – it wasn’t the listing price. As a buyer, you don’t have to pay your Realtor a fee for helping you – they are paid a percentage of the purchase price though escrow after you buy a home. So it doesn’t cost you anything out-of-pocket to work with a Realtor, but offers you the most benefits as a buyer. Trust me, just like trying to write your own legal contracts without an attorney, you’ll want to save yourself a headache and have an experienced Realtor help you. I’m probably going to be asked about my own real estate services – although I am indeed a licensed real estate salesperson (DRE # 01993273), I am currently not active nor is my license with any brokerage. Due to blogging full-time I can’t afford to split myself between two jobs! However, I keep my license current and strive to always be well-informed about the real estate market. You can find a local Realtor on Realtor.com, by referrals, or a quick Google search for Realtors in your area. Make sure to read reviews, ask questions, and go with your gut to pick the Realtor that’s the best match for you. Do you plan on buying a home soon? Let’s chat in the comments below and be sure to subscribe to my newsletter for more real estate and homeowner advice. I really loked how detailed your blog regarding purchasing a home is. A lot of great notes that most people dont know and honestly probably keeps them from purchasing a home. When you take in to account the cost and benefits of buying vs renting it is worth it. Just to clarify the EMD is not an extra expense. Its counted as a credit towards the Down Payment at the close of escrow when the buyers funds are due. VA Loans are not exclusive to veterans, active military personnel do qualify, and once you use your VA loan eligibility you van use it again under the correct circumstances. There is also great 0 down programs, but its really like a silent 2nd until the 1st loan is paid off. Yes, the EMD does go towards the down payment but most people forget that the EMD should be submitted along with their offer and are oftentimes not prepared for the cost. Many assume all they need is the down payment when closing! My apologies for the confusion, it was late when I wrote this and as to avoid information overload to my readers I wanted to simplify this post. I am aware of the VA loans as well as 0 down programs you mentioned, but I felt inundating people with too much new information might overwhelm people reading. Thanks for the feedback!